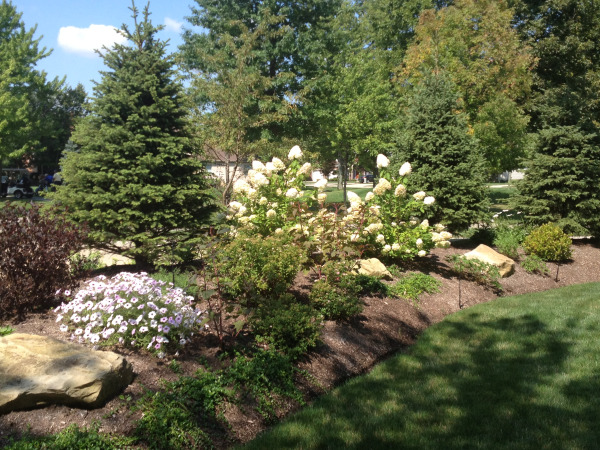 When planting trees, shrubs, and flowers; most homeowners consider it a task for the spring. However, What many people don't realize is that fall is a great time for planting, and there are many reasons to plant in the fall. When relocating larger trees and shrubs consider digging them during the fall to minimize shock from cutting into the root system in the digging process. Most plants are also done growing and are already budded for next year. You still have to water your new plantings but with the cooler and wet fall weather, frequency and the amount of water is much less! The time frame for planting is greater. You can plant into the winter until the ground freezes. Last year the ground stayed unfrozen most of the winter. Warm soils encourage root growth and roots will continue to grow until the ground freezes. When root growth returns in the spring the roots will continue to develop at a faster rate. Most garden centers stay open year round and have clearance sales to reduce their inventory in the fall. Spring is a good time to plant also, but the ground is soft and wet from freezing and thawing. In the spring there is more chance of doing damage to the surrounding bed or lawn areas in the planting process. Remember, fall is also the perfect time for planting bulbs! Right now most garden centers have a wide range of bulb types and colors. The bulb auger that fits easily into a cordless drill has made this planting process very simple. Don’t forget the bone meal to add to each bulb. Read the directions on the package for the best depth for each type of bulb. Enjoy the results, and spring color!